Dave Grohl and Liam Gallagher don’t have much in common on the surface. Personality-wise they’re on polar opposite ends of the spectrum – one is a relentlessly humble crowd-pleasing ambassador of US rock, whilst the other is a straight-talking Twitter-rowing cocky jack-the-lad of Britpop fame. So why have I decided to lump them both under one review, other than being the lazy sod I am? Hear me out. Both artists rose to fame in the 90s making catchy, stylistically-unique rock anthems and have since continued to remain omnipresent personalities in the rock scene. Even after the inevitable Oasis breakup, Liam continued to make music via his Beady Eye project, whilst Grohl has continued to front the Foo Fighters despite every other member seemingly being replaced. Each rock star has brought an influential and distinctive sound that they’ve stayed loyal to and right now they’re both at a very similar stage in their careers. Gallagher and Grohl have both made half-hearted attempts to deviate their style in recent years. The Foos formula of epic guitars, singalong chorus and occasional screeches was traded in on their 2014 album Sonic Highways for some classic rock homages, but you could hardly call it a fresh new direction. Similarly, Liam Gallagher’s attempt to do something new with Beady Eye ended up more like a cheap imitation of The Rolling Stones, of whom Oasis were already influenced by. Given these small deviations didn’t work, the two artists have now gone back to their original sounds. Reliability can be comforting – if it ain’t broke, don’t fix it. But after twenty five years of the same shtick, you have to wonder whether the magic is starting to wear off. I say this as a diehard Foos fan and a long-time Oasis lover. Both Concrete and Gold and As You Were turned out to be everything I anticipated. There’s even signs that they’re now ripping off their old songs. The Foos 9th album begins with an acoustic intro titled ‘T-shirt’ that sounds identical to the opener of 1997’s The Colour And The Shape. ‘For What Is It Worth’ meanwhile feels distinctly like a watered-down ‘Don’t Look Back In Anger’. These may well be deliberate self-references, but it doesn’t make them feel any less derivative. Of course, both artists can still craft tunes that feel original and infectious enough to make you forgive the blander moments. The Foos lay down a three-hit-combo at the beginning of the record including screech-along lead single ‘Run’, groovy Aerosmith-esque ‘Make it Right’ and belting stomper ‘The Sky Is A Neighbourhood’ that almost has an Imagine Dragons tinge to it (in the best possible way). Liam’s ‘Wall of Glass’ meanwhile opens As I Were in spectacular style with squealing harmonica and bluesy guitar, whilst true anthems such as tumbling ‘I Get By’ and hazy ‘When I’m In Need’ spring up later in the tracklist. Both artists have never tried too hard when it comes to lyrics. At this point it’s a mixture of clichés and nonsense, although Liam’s horror-themed balderdash ‘She gotta 666/ I got my crucifix/ She got a spinning head/ Likes The Ungrateful Dead’ is a lot more witty and entertaining than the Foos’ ode to aliens ‘The Sky is A Neighbourhood’. That said the Foos have the advantage that their LP is half the length of As You Were, which begins to overstay it’s welcome beyond ‘Come Back To Me’. 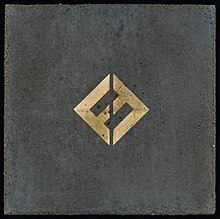 Gallagher and Grohl certainly have put some graft into these albums and both have a superb ear for melody and a good chorus, but both could benefit from coming up with an album concept rather than creating another medley of songs. Consider Queens of the Stone Age’s latest release – whilst I did find the production off-putting, you can’t argue that it has its own flavour. A reliable recipe works only for so long – sooner or later people want to taste something new.